Because of this, it is important to own an all-around LED spotlight with versatile applications. 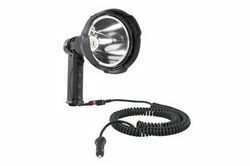 The Larson Electronics rechargeable LED spotlight (HL.RL-85-LED-CPR) is a portable unit that is capable of meeting various illuminative requirements, while withstanding a wide range of rough environments. Read on to learn more about this IP65-rated, impact resistant LED spotlight. Rechargeable LED spotlights are equipped with portable features for reliable illumination in outdoor locations. The low voltage unit’s spotlight beam, focused at 30 degrees or tighter, is capable of reaching far targets with ease. The 25-watt HL.RL-85-LED-CPR can light up an object hundreds of feet away, while generating up 2,000 lumens. A parabolic reflector inside the handheld fixture directs the light beams towards the target area. The LED spotlight can withstand rough handling, impacts and environments. An ABS shockproof polymer body helps absorb exposure to vibration and dust. The light head is constructed of aluminum alloy and reinforced with an impact-resistant polycarbonate lens. A gripped nylon handle ensures limited slippage in wet environments. Activation is streamlined via an accessible push button (on/off) switch. In the latter stages of the portable lamp’s lifespan (after 50,000+ hours), it can retain up to 70 percent of its lumen output. As an energy efficient light source, the LED spotlight runs on a 2,600 mAh lithium-ion battery and provides 3 hours of runtime per full charge. Charging time takes approximately 3 hours, via a standard 12V source. Operators can charge the portable lamp with the following attachments: coil cord with cigarette plug (C-16CP), cord with spring battery clamps (alligator clips - C-16BC) or cord with ring terminals (C-21RT). Versatile charging options allow individuals to power or charge the LED spotlight using ATVs, portable battery packs, generators and emergency vehicles. Furthermore, the HL.RL-85-LED-CPR can be charged and used simultaneously. The basic features of the LED rechargeable spotlight can be customized and extended for meeting specific lighting requirements during application. Starting with lens color options, the unit’s lens can be replaced with a red or green cover when ordering the device. These colors are applicable during hunting, fishing and military exercises. Red and green lenses can help hunters maintain covertness in the field at night. Some nocturnal animals, such as coyotes, have a difficult time detecting red light beams. Green lenses are also suitable for nighttime hunting (mostly wild pigs). The rechargeable lamp’s pistol-grip handle ensures fast draws and handling. Hunters don’t have to worry about accidentally dropping the luminary, while posting up in trees. The solid handle is also useful for quickly scanning the area for predators. Fast scanning ensures minimal risk of detection. The HL.RL-85-LED-CPR can be utilized by anglers to attract plankton to the surface of the water. This technique attracts large fish close to the boat by first luring microscopic creatures at the bottom of the food chain. When used to attract fish, the anglers can shine the spotlight from the boat, eliminating the need for submersible or tethered floating lamps. Towing fleets and agencies or businesses that offer emergency services are fond of using handheld LED spotlights. For tow trucks and fleet managers, the portable lamps can be used on the go and stored in the vehicle, while charging. Colored lenses are applicable for signaling at night or during extreme, low-visibility conditions. During after-storm cleanup operations, the battery-powered luminaries may become a temporary source of illumination, since it does not rely on line power. When conserving generator use, the lamp can be charged via batteries and mainstream vehicle cigarette outlets. Military and law enforcement groups use both white and colored LED spotlights during field excursions, deployment and patrolling. Red spotlights are effective in preserving night vision and promoting certain visual landmarks during map reading. Patrolling urban locations with a powerful LED spotlight offers several safety benefits. During dangerous confrontations, law enforcement reps could interrogate potential criminals from a safe distance. The cordless features of the portable LED lamp maximizes movement around the area. Police can run in any direction, approach the target without losing visual contact or call for back up with minimal effort. For more information about the Rechargeable LED spotlight, head over to the Larson Electronics website.